Are you all getting excited for summer? I know I definitely am! Lately I’ve been trying to clean up and refresh our outdoor space in the backyard. Spring gets me so excited to have bar-b-ques, swim parties, and revel in the freedom that summer seems to bring. 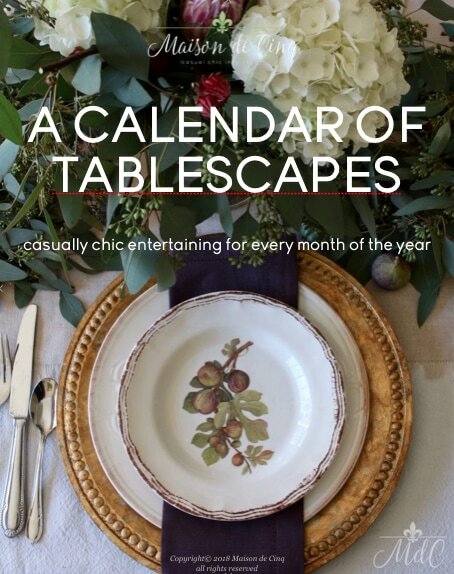 In the spirit of that, our blogging group is talking “outdoor spaces” in our monthly blog hop this month! For me, I love entertaining outside in summertime. Because we live in Southern California, we’re lucky to be able to enjoy our outdoor space for quite a few months out of the year. However, we admittedly use it much more in the summer than any other time. I mean, is there anything better than lingering outside after dark, sipping some wine or enjoying a cocktail with friends while the kids play in the pool? Heaven! To be honest, we need to do some work on our pool and some re-landscaping, but for now, I need to work with what I have! So for this post, I’m sharing how I’ve tried to update the space with plants, flowers, and outdoor accents. Right now, I’m all about accessorizing and making the most of what I’ve got! 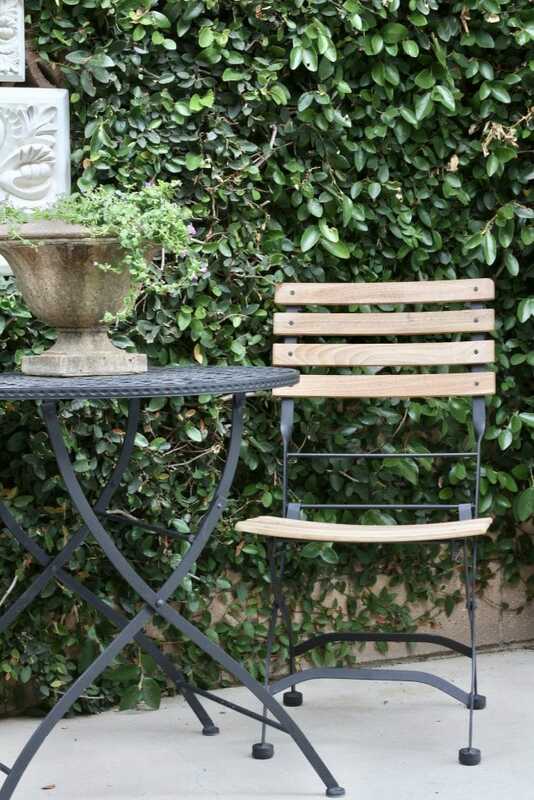 One thing I did to add interest to the patio was to buy this little bistro table and chairs set. Because the backyard needs some work, I wanted to distract from that. This little seating area does the job! It’s charming and sweet, adds extra seating when we need it, and makes for a nice little corner in which to have our morning coffee. 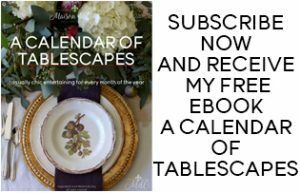 Mine is from Ballard Designs (and I think it’s still on their site) but I’ve also linked some similar sets at the end of the post that are even less expensive. 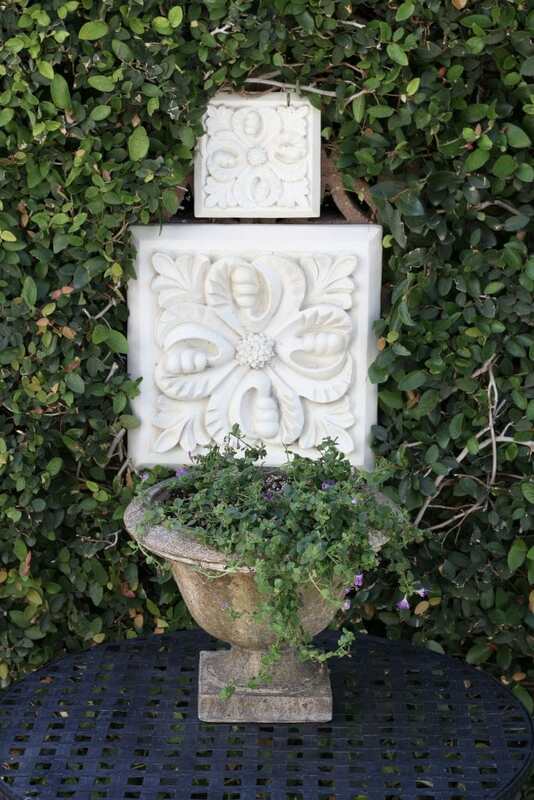 Another item that’s great for decorating your outdoor space is wall decor. And these days, there are tons of options! Everything from art, to wall plaques like mine, to clocks, all in made-for-the-outdoors materials. I’ve owned these plaques for years, but only just recently moved them to this wall. I cleared out a space from the fig that covers the wall and made for a little focal point. Again, it adds some interest to what was once a pretty bare wall, and I didn’t spend a dime! Our dining area is one we use a lot, as we love to grill and during the summer we eat outdoors probably 5 nights a week! This table was actually made by my husband from the farmhouse table plans on the Shanty 2 Chic website, and the chairs are World Market (similar here, here, and here). They aren’t outdoor chairs, but they are under a patio cover and I treat them every spring. So far, they’ve survived pretty well and they were a fraction of the cost of the outdoor chairs in the same style. 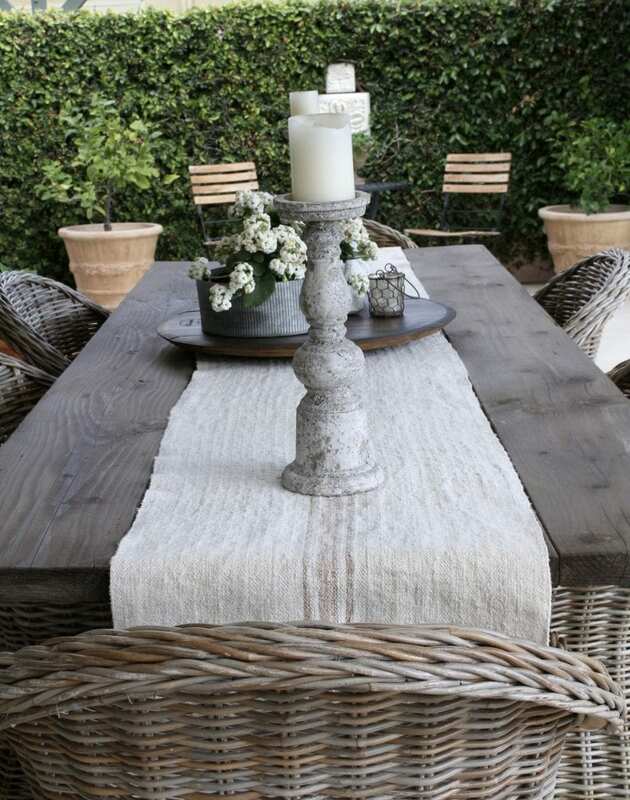 I always love to decorate the table a little, and usually have a vignette on the wine barrel lazy Susan. Here I planted one of my favorite plants, Kalanchoe. 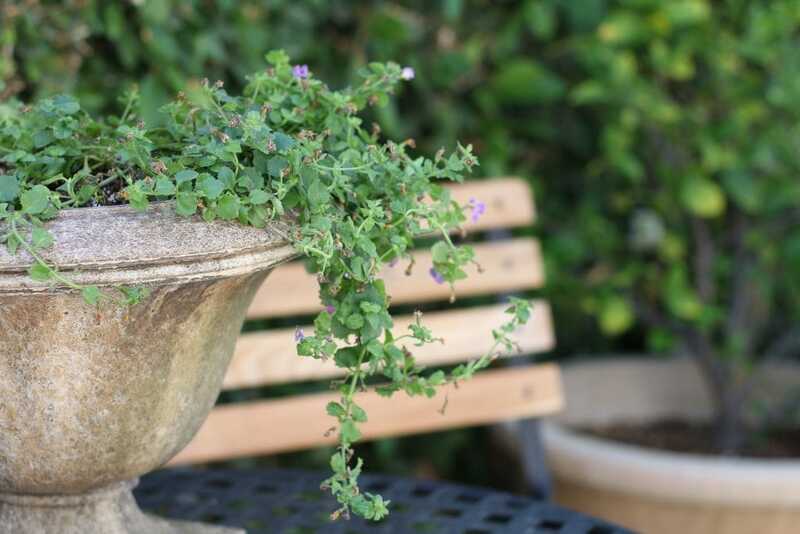 It’s actually a succulent, so it does very well in the summer here and lasts long in a pot. 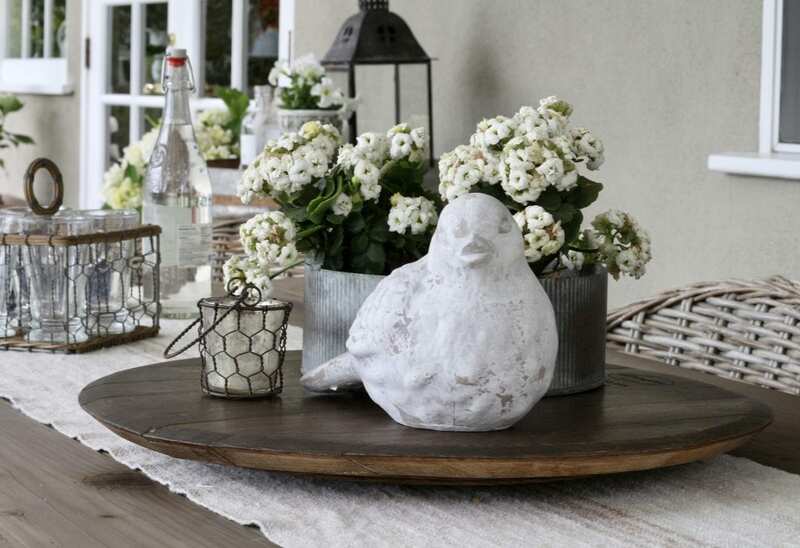 The candle holder is Pottery Barn and the bird statue was from Home Goods. 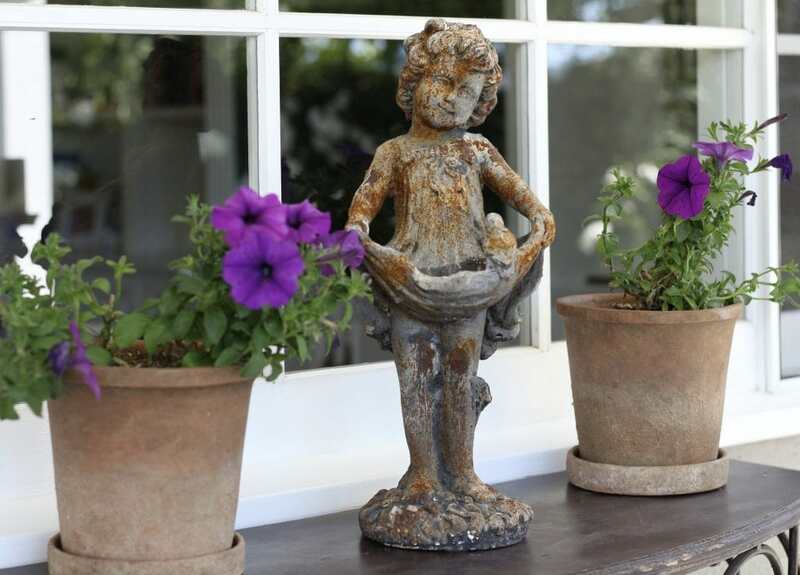 On the console table I have my favorite little girl garden statue, and two Target planters with Petchoa plants. If you want to see more of how I added color with flowers from Monrovia, you can see the full post here. I’m still really loving the purple as a pop against my usual white flowers. 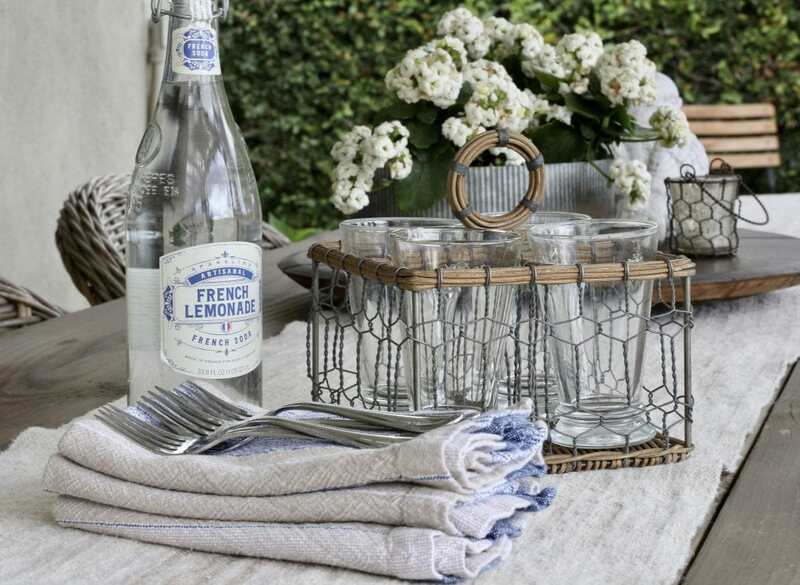 The table is set for lemonade and some snacks. The chicken wire caddy is actually made for flatware, but here I’m using it to carry out some bee glasses from Sur la Table. I love things that can be used for more than one purpose! On the opposite side of the yard from the dining area, is our pool and this small lounge area. Again, nothing fancy over here but I did buy cute patio furniture from Ballard Designs a couple of years ago. 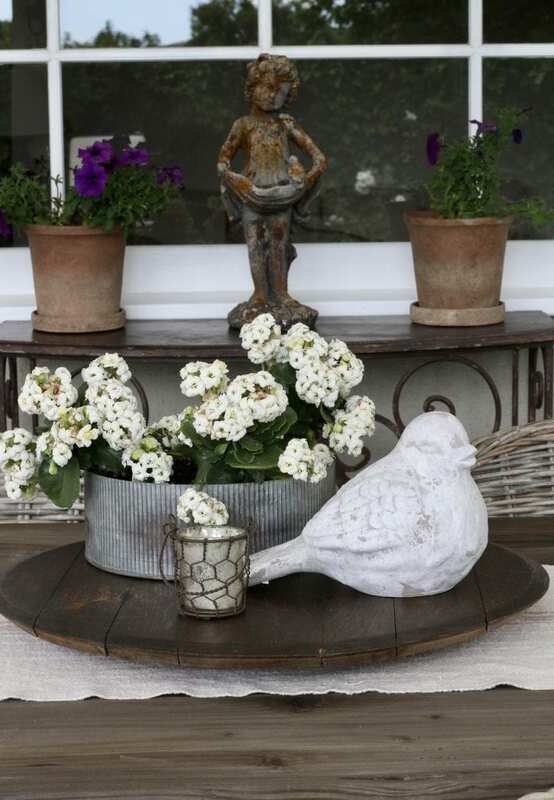 This spring, I added some pots with flowers, and some decorative items like a lantern and garden statue from Home Goods. I really think adding decor the same way you would on the inside of your home helps make for a more inviting outdoor space. 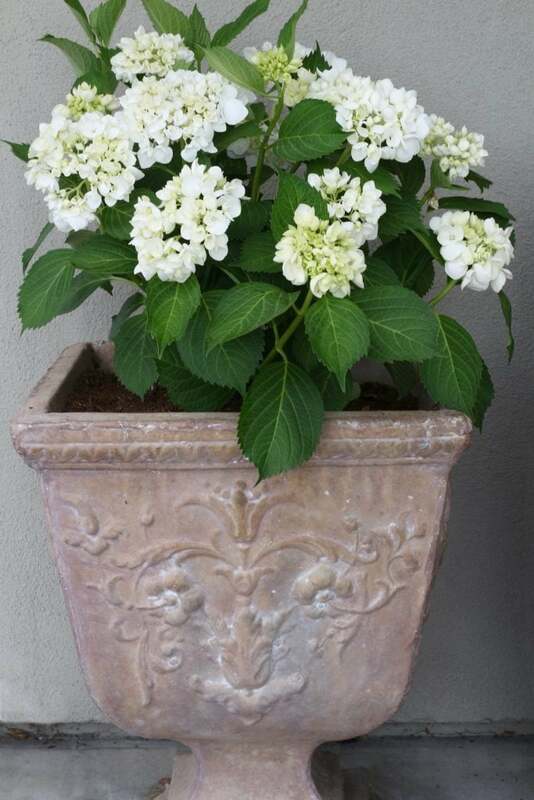 And of course, I have to have some of my favorite flower, white hydrangeas! I have two of these pots flanking the french doors. 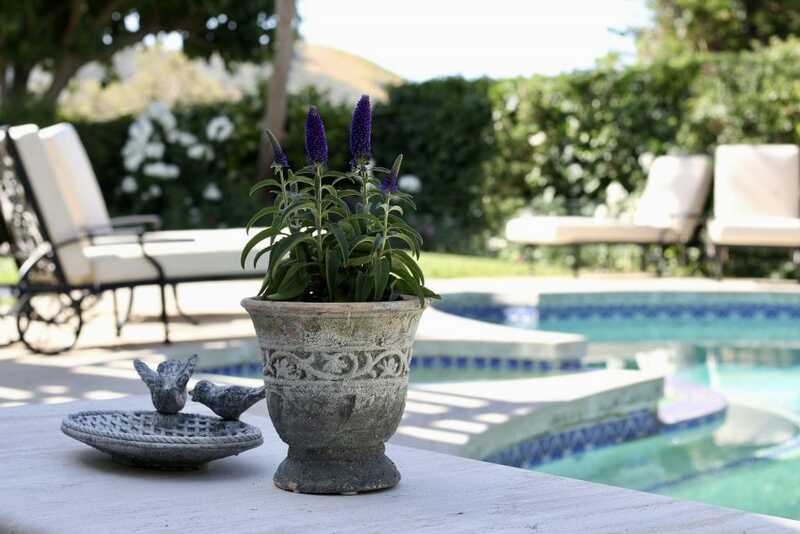 HOW TO FRESHEN UP YOUR OUTDOOR SPACE FOR SUMMER! This runner is made from an antique grain sack and the candle holders were from a local store a few years ago. I find lots of grain sack items on Etsy and am contemplating buying more of these with different colored stripes! 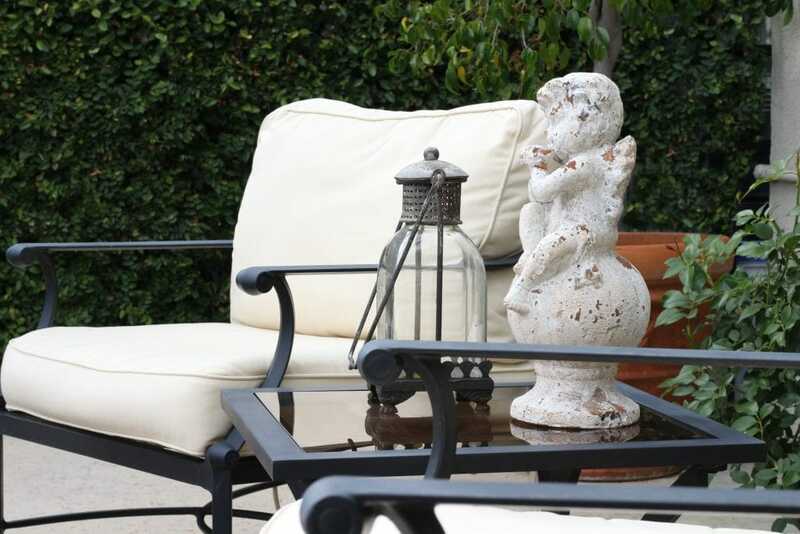 Hopefully I’ve helped inspire you to start thinking about your outdoor space, or at least given you some ideas for ways to update them without breaking the bank. I hope you will also visit my friend Tamara at Citrine Living next. She has beautiful taste and I love everything she does, so I’m sure she’ll have some amazing outdoor areas to share with you! Here is the full line-up of the all the bloggers participating this month – I know you’ll get lots more inspiration from them all! Hi Janet, they don’t have a color in particular (in other words, there was no choice of color when I bought them). They were from World Market and they are definitely on the grey side. I linked several that are almost exactly like them in the post! Hope that helps! 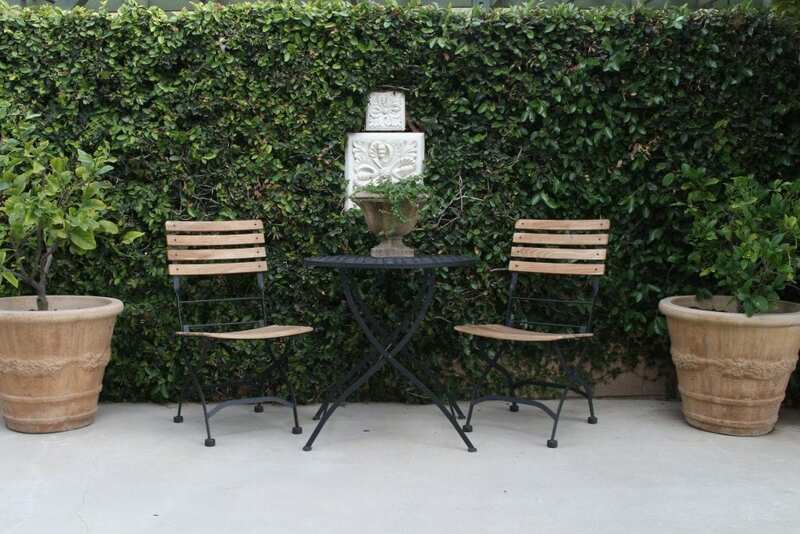 I love your back yard Sheila, it is so inviting and I absolutely love the new bistro area and those wall plaques….and that garden statue of the little girl… so lovely!… you did a great job! Thanks so much Alicia! 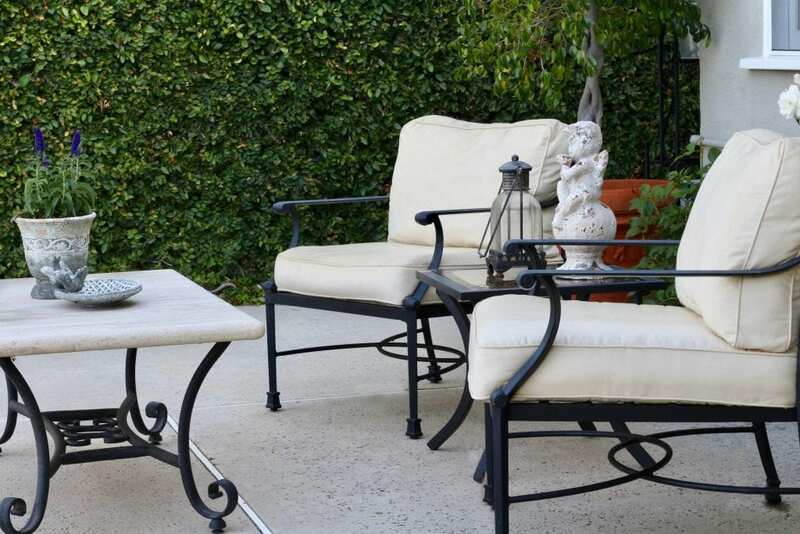 The bistro set was a definite boost to the overall space I think, and I’m so glad you agree! And I love that girl! Though she did take a beating this year and get pretty rusted from the rain. I guess we’ll just call it patina, right?! 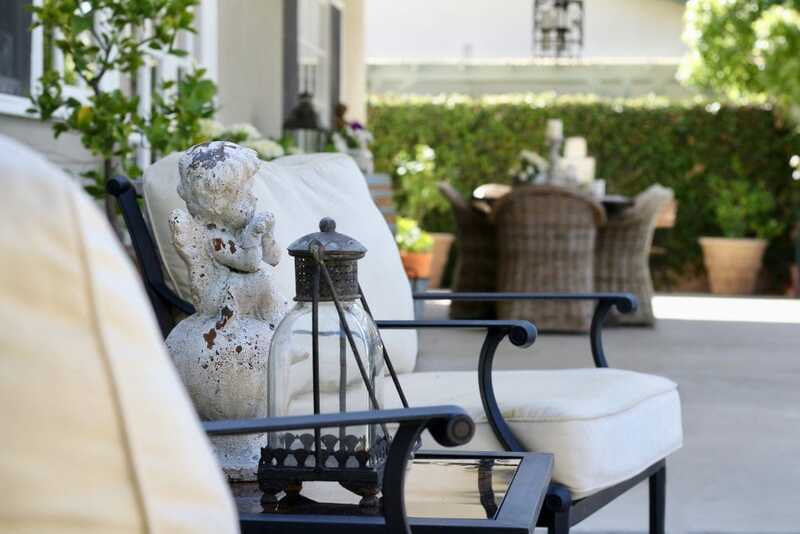 Sheila, I just love the European flair your home has, and your back yard is just gorgeous! It feels like you’re away in another world out there! I would love to visit and relax by that pool all day! So beautiful! Tamara, that is about the best compliment I could ever get! I adore Europe and am always striving for that same Joie de Vivre! And you are welcome anytime my friend – I would love to have you visit! Sheila, your backyard is so relaxing! I can’t believe your husband made that table… that is fantastic! I love the chairs your dining chairs and all of the black and white chairs as well. What a nice place to sit back and have a drink! Thanks so much Angelina! He actually doesn’t like the table! He thinks he should re-do it! I’m perfectly happy with it though, I have to say. And thanks for all your kind words on the backyard! It certainly doesn’t feel very done so I really appreciate it! Hi Sheila- Your backyard is such a retreat! You know that I love your dining table and chairs and that peak of the pool make me want to see more. SO fun. Oh thanks so much Amie! I love the chairs too, and even though they are not for the outside, I had to have them! And our pool may soon be re-done which would be so exciting. Always fun “hopping” with you! 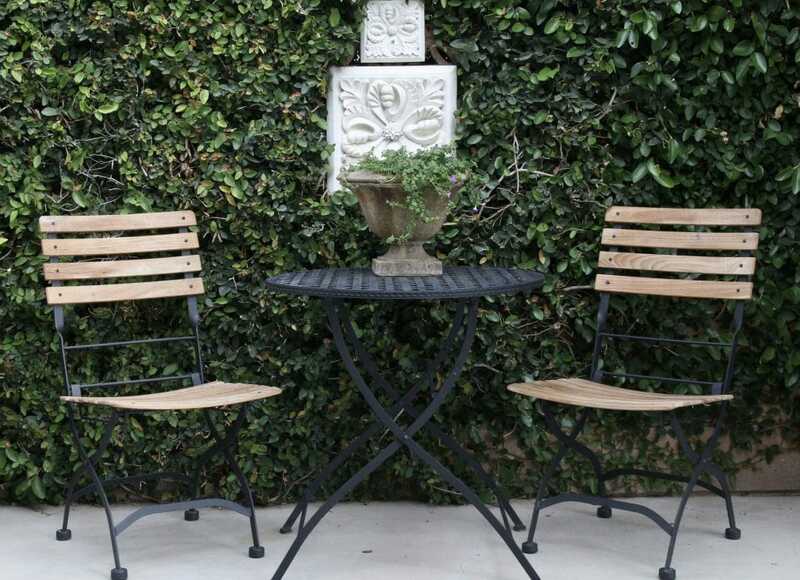 Sheila, I love the bistro set in front of the hedges. It looks so cozy yet sophisticated. How nice that you have a covered area so you can use indoor chairs. Our deck is in full sun and half the time it gets too hot to sit out there in the summer. Good ol’ east coast humidity! 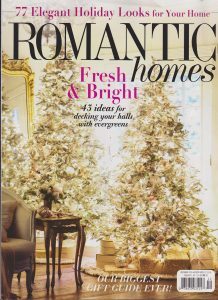 Love seeing your gorgeous space! Someday, I hope to sip wine out there with you! And thanks for the compliments on the back! We are desperately in need of new hardscape and need to re-do the pool so right now just some inexpensive ways of freshening up is what I needed! Next, we tackle the re-do!!! By the way, my indoor chairs from World Market are now made in outdoor material!! They were not when I bought these, but the ones I linked to are outdoor – take a look!! 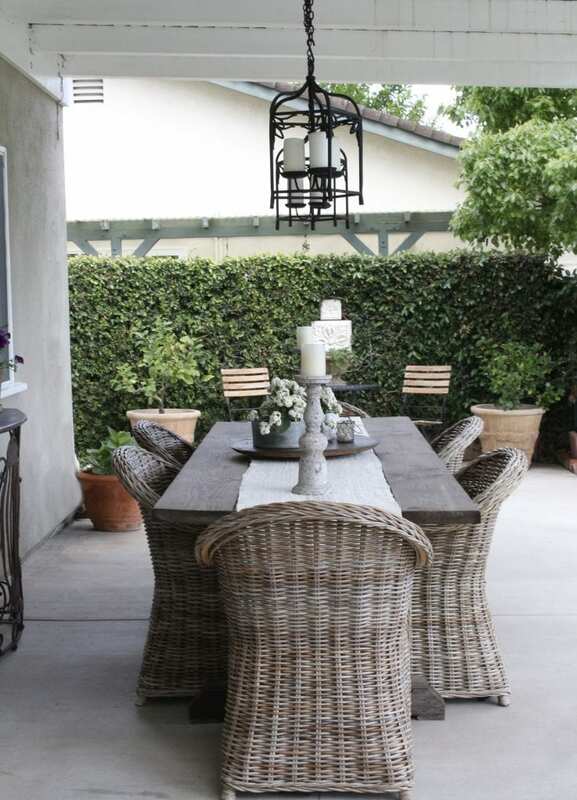 I love your sophisticated and charming backyard oasis, Sheila! So beautiful! And what a great idea to move those plaques to the wall – they add so much charm! Thanks so much Kathleen! It’s a little hard when there is major work to do, but I’m trying to at least distract from the flaws and make it look a little more presentable!